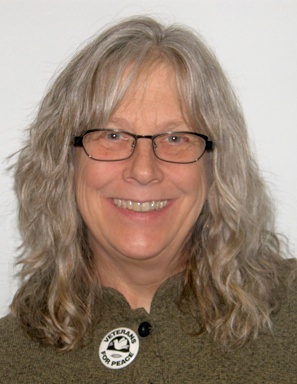 Leah Bolger, former national president of Veterans for Peace, will give the annual Ava Helen and Linus Pauling Memorial Lecture for World Peace at Oregon State University on Tuesday, April 30. Her talk, “Waging Peace,” begins at 7:30 p.m. in LaSells Stewart Center’s Austin Auditorium. It is free and open to the public. Bolger served more than 20 years in the United States Navy, with tours of duty across the world. She received her master’s degree in national security and strategic affairs from the Naval War College in 1994 and was a military fellow at the Massachusetts Institute of Technology in 1997. Since her retirement in 2000 with the rank of commander, she has dedicated herself to being a full-time peace activist. After moving to Oregon in 2004, she formed the Linus Pauling Chapter of Veterans for Peace and served as its president for three years. In 2012 she became the first female president of the national Veterans for Peace. Bolger has organized numerous public events, spoken before audiences large and small, presented workshops and served on panel discussions. She has testified before the Oregon Legislature, and has lobbied both state and federal officials. She has also been arrested numerous times for acts of civil disobedience. The OSU lectureship honors Linus Pauling, an OSU graduate and two-time Nobel Prize laureate, and his wife, Ava Helen Pauling, a noted peace activist. It is sponsored by the College of Liberal Arts. This entry was posted in Veterans for Peace. Bookmark the permalink.